Finally had a chance to try out Tuc Craft Kitchen (facebook) in Gastown. What attracted me were their “Nibbles & Bites” like Pork Belly Crackling and tempura-battered Crispy Bacon & Egg. Perfect bar snacks. I settled on two “nibbles”: Pork Belly Crackling + Crispy Bacon & Egg. Here’s the Crispy Bacon & Egg. It’s a soft-boiled egg wrapped with bacon and deep fried tempura-style. Batter wasn’t quite what I’d call a well-executed tempura that’s light, crispy and “cragly”…it was a bit more dense and crunchy but for the purposes of encasing a soft boiled egg wrapped with bacon, it did an excellent job! Crispy, fatty cubes of pork belly crackling with a star anise red wine reduction for dipping or pouring over top. I just dipped. So delicious. Sparks of recognition went off in my head as I ate this…flashes of the best parts of chinese bbq roast pork belly…chicharron…pork rinds. I think they have a larger starter size portion available for dinner 😉 I think I could’ve ate triple this amount. The micro-greens might seem superfluous but I actually enjoyed the little hits of sharp herb. I attempted to knife-and-fork it but really, you must use your hands for the full experience. 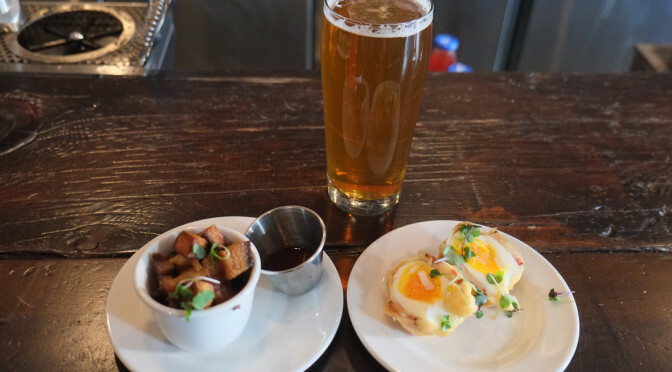 Gratuitous shot of Southern Tier 2XIPA and Tuc Craft Kitchen’s Crispy Bacon & Egg. I polished off the “snacks” but was still nursing my beer while reading an ebook, so the bartender/manager asked me if I wanted to try something off their lunch menu. He mentioned lamb ribs and I said “YES!”. Orange Glazed Lamb Ribs. Comes out of the kitchen bubbling in a super hot cast iron pan. Tender, melting off the bone lamb ribs. I would’ve sworn I’ve seen pics of this dish online before but using a more pork-rib-looking like cut but he said they use basically this cut of lamb but they couldn’t get their usual fattier cut, so this dish used a somewhat leaner cut of lamb rib. It all looks like rack of lamb, but when served this way it’s a gutsy, satisfying, screaming-out-for-beer kinda dish. I could taste hints of orange peel. Sweet, punchy, great foil for my hoppy IPA. Wow, that was great. I spent almost two hours in there just reading, eating and drinking. Dinner menu looks enticing. Meat-centric for sure. Dry-aged rib eye looks good, as does the beer-braised shortrib. Must try. I like how they close whenever they close. Hey, there’s a sensory-deprivation tank place next door!